Rutgers’ beautiful mall on the New Brunswick campus with the back of the statue of “William (Willie) The Silent.” The Dutch William I, Prince of Orange, is honored in recognition of Rutgers’ Dutch founders. We’ve got your back, Willie! Excuse us for living, but Governor Christie’s July 1, 2012 “line in the sand” deadline for higher education restructuring was not as fierce as his first bark. And the messy process was characterized by outgoing Rutgers President Richard L. McCormick as, “The sausage got made.” Rutgers’ end story was legislation that does not take effect until July 1, 2013. This, obviously, gives Rutgers time to evaluate the legislation and the planned implementation and financial impact. Likewise, the year delay gives the Legislature time to pass legislation adjusting the details and providing needed funding as deemed necessary. No caption necessary. Please refer to the words of Rutgers President Richard L. McCormick above. A full blow-by-blow accounting of detailed events as this summer’s July 1 deadline approached would be tedious. Suffice it to say, there were meetings both public and private of politicians and Rutgers officials and representatives, not to mention liaisons with the Rutgers Board of Governors. The 59 member Rutgers Board of Trustees, to the best of my knowledge, did not participate, which may turn out to be a smart legal move. It came down to a vote of the 11 member Board of Governors, not the Trustees, voting 9-1, not “approval” but telling the Legislature to “go forward.” This was accomplished through more than an hour long closed door meeting of the Board of Governors, some by conference call, just hours before the Legislature voted. After dozens of amendments, the Legislature voted on Thursday, June 28, meeting Governor Christie’s July 1 deadline. 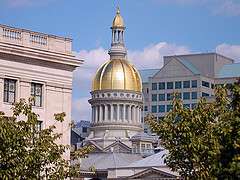 The New Jersey State House, Trenton, New Jersey, home of the New Jersey Legislature. Rutgers will take over most of the University of Medicine & Dentistry of New Jersey (UMDNJ) including its medical schools in Newark and New Brunswick-Piscataway. University Hospital, Newark, part of UMDNJ, will become its own entity, partnering with a private hospital chain. The School of Osteopathic Medicine in Camden, also part of UMDNJ, will be turned over to Rowan University, 18 miles away in Glassboro, New Jersey. 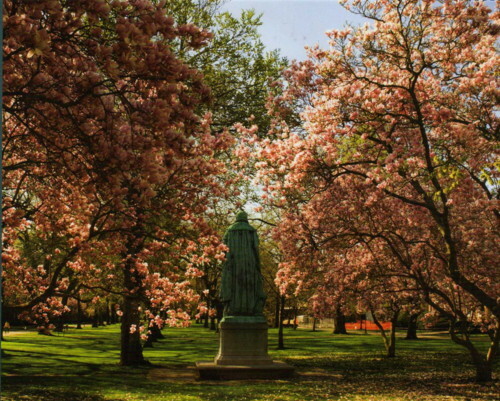 Rutgers-Camden will continue as part of Rutgers University and its financial operation. Rutgers-Camden and Rowan University will form a Board to oversee joint science-health programs between Rutgers-Camden and Rowan University’s Cooper Medical School located in Camden. Both the Rutgers-Newark campus and the Rutgers-Camden campus will form advisory groups to the Rutgers Board of Governors in New Brunswick. Governor Christie did not sign his July 1 drop dead deadline legislation into law until Wednesday, August 22, 2012. In the process, the Rutgers Boards of Governors and Trustees have retained legal consultants Cain Brothers, New York, to exercise their “due diligence.” They did so in order to assure that any outgrowth of the legislation is in conformance with the Rutgers Act of 1956. By that Act, both Boards must consent to any changes proposed in the legislation before those changes can take effect. Of no small concern is the sizeable UMDNJ debt of $450 million to bond holders, not to mention Rutgers taking on 7,000 new students, in addition to its present 58,000, and 15,000 new employees, added to its present modest 8,000. – -No small considerations in the least! Eventually, both Rutgers Boards expect to vote on the changes. To put it mildly, “the process” left much to be desired. Where was the public deliberation? What were the alternative choices? Where was the integrity? Rather, we had old time horse-trading behind closed doors. George Norcross, South Jersey Democratic political boss and coincidental Chairman of the Board of Governors of the new Cooper Medical School of Rowan University, got his income stream from his Republican friend, Chris Christie, with a new Board to oversee joint science-health programs with Rutgers-Camden. Governor Christie made good on his political promise to George Norcross to deliver a potential research university for South Jersey in the form of Rowan University through Norcross’ Cooper Medical School & the new tie to Rutgers-Camden. Outgoing Rutgers President Richard L. McCormick got his medical school for Rutgers without giving away Rutgers-Camden, no thanks to him, but thanks to the outcries of the Rutgers community of students, professors, alumni, and the Board of Trustees! Incoming Rutgers President Robert Barchi, formerly President of Thomas Jefferson University, a health sciences medical university in Philadelphia, innocent in the process, receives a “medical mess” to straighten out in the form of UMDNJ and to prove himself to dear old Rutgers. Most of all, thanks to the outspoken voices of Rutgers Board of Trustees, guardian of the soul of Rutgers and by law protector of its assets and property, the Rutgers-Camden campus and Rutgers-The State University of New Jersey as a whole were kept in tact!!! Rutgers must be like a massive oil-tanker: very hard to turn, and when it does, it goes slowly… Not sure I know all the pluses and minuses of the issue. But I do know that such a gigantic undertaking is difficult, no matter what the benefits/detriments. What is your assessment, Phil? Intelligent response as always. I like the analogy of the big oil tanker, straining to turn slowly. Major change is difficult as you say with pros & cons. I’ve had my share of “change experiences” as a public school administrator with three major reorganizations of the entire school district within four years.–A crazy superintendent of schools backed by the Board of Ed. & the PTA head. Sparing you the details of what that entailed, besides all the turmoil, teachers & principals got sick & one poor teacher died. I learned that there is good change & destabilizing change. My concern for Rutgers is in the numbers. Look at that debt I quote of UMDNJ, $450 million to bond holders. Then look at the number of RU employees, adding 15,000 UMDNJ staff to Rutgers present 8,000. –That is definitely destabilizing!!! The addition of 7,000 students to its present 58,000 I think RU can absorb. Unless Robert Barchi turns out to be an outstanding administrator as the new President, &, indeed, he may, the restructuring/addition to Rutgers could turn out to be a paper shuffle of who owns UMDNJ on paper. And in reality, it will not make a difference. Putting the name of Rutgers on the problems & corruption at UMDNJ will not make it disappear. Barchi must bust up UMDNJ into sizable parts, clean out the corruption. & then bring it together under the Rutgers’ brand. The history of UMDNJ & New Jersey’s medical school(s) goes back to the original medical school in New Jersey. It was 1954 & part of Seton Hall University!!! And who bought it? — 1965 The State of NJ, NJ College of Med & Den (NJCMD), relocated in Newark. But Rutgers had started a two year med school in 1961. So 1970 the State combined NJCMD with Rutgers med school & formed CMDNJ. In 1981 it became UMDNJ. IT’S ALL IN WIKIPEDIA better than I can explain! By now you are sorry you asked!!!!!!!!!!!!!! Chip Noon IS THE GREATEST because he cares!!!! May God truly bless your grand heart!!! Thanks, Phil. I am truly humbled! I do care, but don’t always have all the info on RU since leaving and living in NH! New Hampshire, of all places! Anyway, love your posts! Keep them coming.